Don’t worry… we have seen it all before! 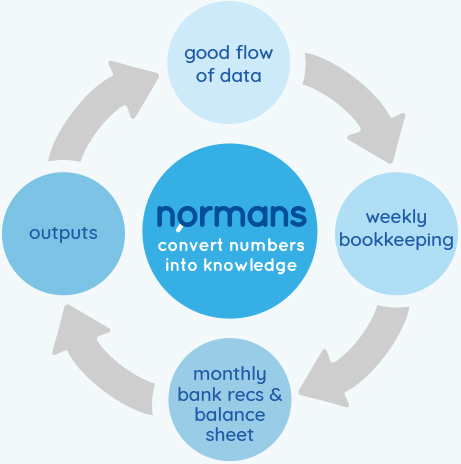 At normans - What we do is far more important than the software we use.. we may change the software, but we will always provide an exceptional and professional service. Knowing how to utilise the benefits that the right software can provide and how that helps us give you better control of your finances is something that we pride ourselves on. Saving you time while ensuring we get the vital information to you so we can do what we love, sorting out the numbers, turning them into knowledge. You might want to fully understand your businesses financial health and need someone to convert those numbers into knowledge! Whatever your reason for exploring the option to outsource your bookkeeping here is a full list of exactly what we can do for you. Credit control – we contact your suppliers and customers on your behalf and agree beneficial terms to keep your cashflow at a suitable level. Bank reconciliation – a monthly check is completed to ensure what your records state matches the actual cash in your accounts, this can include meticulous exploration and a full explanation when there are discrepancies or differences. VAT – we complete all your accounts in a timely manner and get your VAT returns in nice and early to avoid any fines. You will know ahead of the bill what your expected VAT charges will be from our monthly tallies and reporting. Monthly accounts – every aspect of your accounts are kept up to date, with all the information put into your monthly management accounts report. And remember our staff are not only experienced and expert in these tasks, they also enjoy doing them! So your work is completed quickly, accurately and effectively and when we are representing your company in communications our staff are professional courteous, knowledgeable and fair. We pride ourselves in our customer service skills and approach. Monthly management accounts report – a bespoke report that can focus on areas you select, but that will also highlight areas of your accounts you need to consider. Includes charts and graphs for those who prefer visual representation along with a detailed narrative written in plain English, not financial terms and expressions. For smaller companies this report gives you the knowledge to make sound decisions on the growth and running of your business. For companies with a board of directors, partners or a group of managers in various departments this will help you communicate the companies’ financial health to those individuals. Liaison with your year-end accountants to ensure that all your accounts are presented in a format that makes your year-end accounts and tax returns an easier job, saving you costs in that area along with the reassurance that your accounts are in order and there is no risk of being charged for compliance work with your year-end accountant. Do you what to be more organised and up to date of your business finances, and maintain that once in place? Well that’s what we do, every day for our clients. Please fill out the form, or call us, for a no-obligation conversation about your bookkeeping needs.